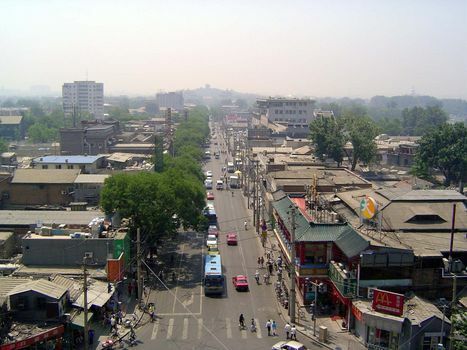 Beijing's old city, until the 1950s delimited by the wall around the Inner and Outer cities, is now delimited by the city's Second Ring Road. 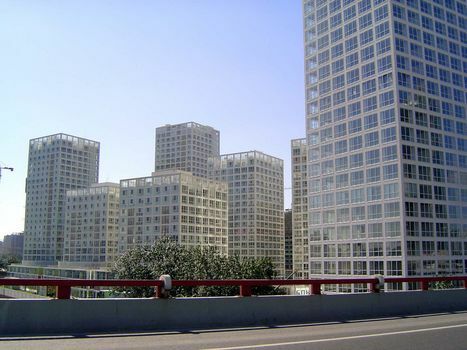 Beyond that road lies a vast area of modern construction, mostly highrise. 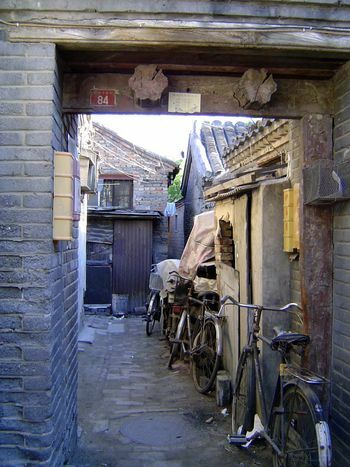 Within the old city, however, there are still hundreds of the city's famous alleys (hutong) and single-story courtyard houses (siheyuan). Developers in recent years have elbowed their way in to make a killing, but the problem is deeper than that. It goes back to Mao. He encouraged the city's growth, whose population went from half a million in 1949 to five million in 1970. 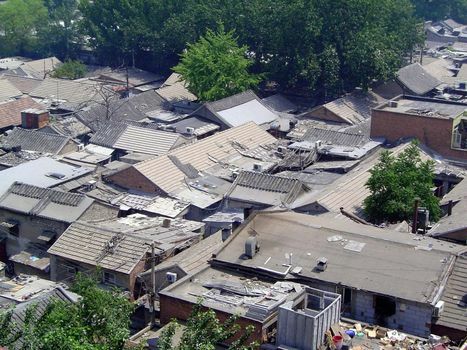 He did little to house the newcomers, except allow them to move into existing siheyuan, which went from housing one family to housing half a dozen. After 1957, the owners couldn't even charge rent. 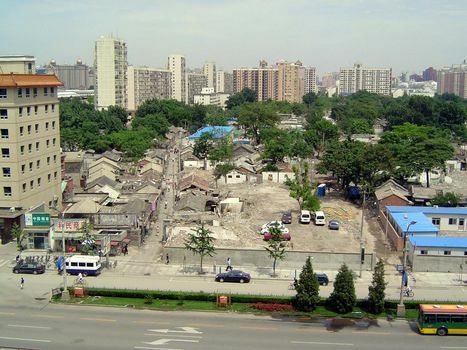 Restoring the siheyuan, in other words, means not just fixing them up but displacing most of the people living in them. 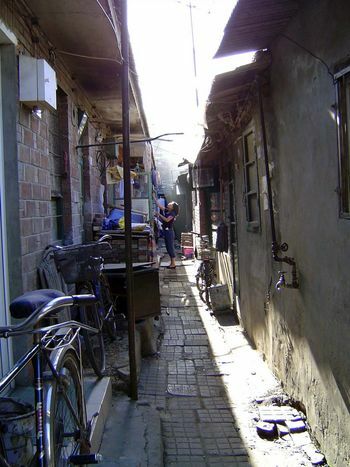 What's easy to miss, even if you wander around the city at length, is that the great majority of the old city's alleys run east-west at intervals of about 60 or 70 yards within the superblocks formed by the city's arterial streets. Accidental? Absolutely not: the object is to have the entrance to each house on the south. To do that, streets have to run east-west. Here's a simple entrance. 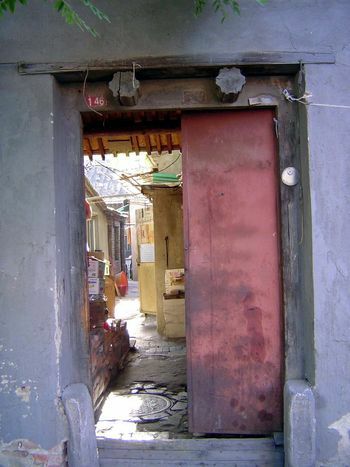 It leads to the former home of Lao She, a writer who died--probably a suicide--during the Cultural Revolution. The house is a museum, if that's any consolation. Keep your eye on the second door, in the background. We've gone through that second door, crossed the courtyard, and turned around to look back. Keep your eye on the fire extinguishers. We've panned right now to take in the building occupying the south side of the courtyard. It's in shade. Here's the view from the south side looking northwesterly to the sunnier building on the north side of the courtyard. 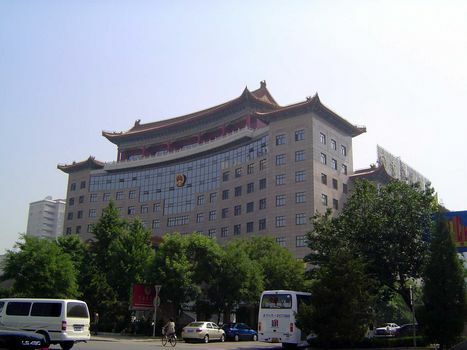 The buildings are never connected by corridors, except in the proposals of architects seeking to build modernized siheyuan. The trees, by the way, are typical. Conifers are avoided, because they're associated with tombs; instead, fruit trees are planted. 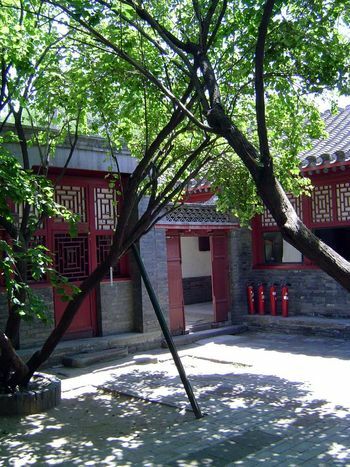 Also, although there's a strong avoidance of even numbers in the design of these houses, the courtyard trees are an exception and are usually planted in a pair. 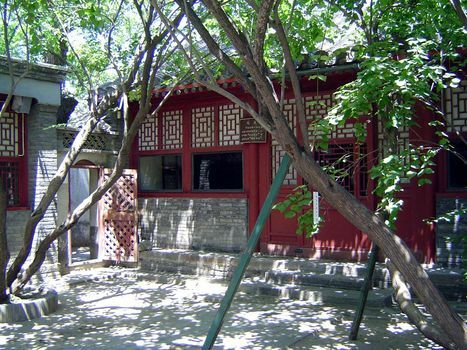 Another example, this time the former home of Lu Xun, another writer. Judging from the shadows, we're looking at the building on the north side of the courtyard. 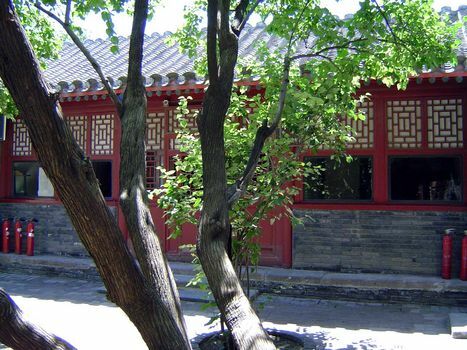 The layout of the house echoes the layout of the palaces and audience halls of the Forbidden City. 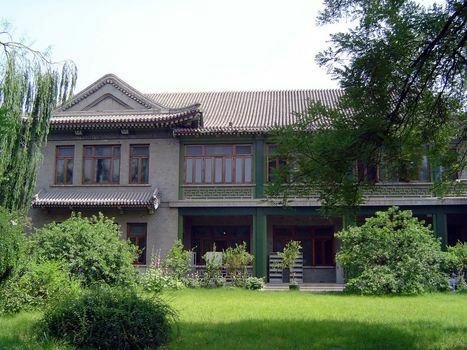 In both places, visitors enter on the south; in both places, pride of place belongs to the south-facing principal house (zhengfang), always subdivided into an odd number of rooms, with a central parlor. In a traditional home, with an extended family, the patriarch and his wife lived in the rooms to the right or east of the parlor; concubines were on the west. 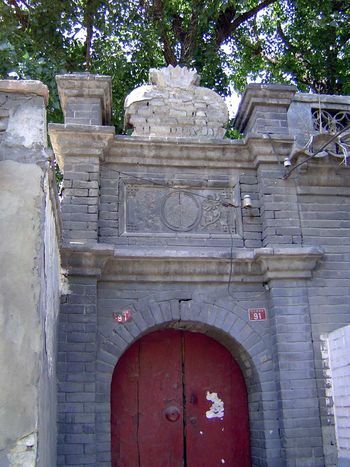 The rooms on the side or wing buildings (xiangfang) might be studies or the home of the wife's son. The north-facing building, "reversely set," was for storage, kitchens, or servants. The principle is clear from the adage: "Rich men don't live in eastern or southern rooms." 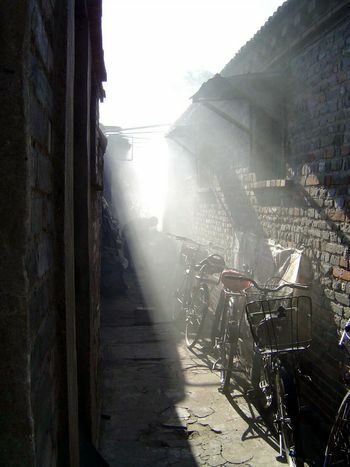 Wealthier people might have sets of courtyards. 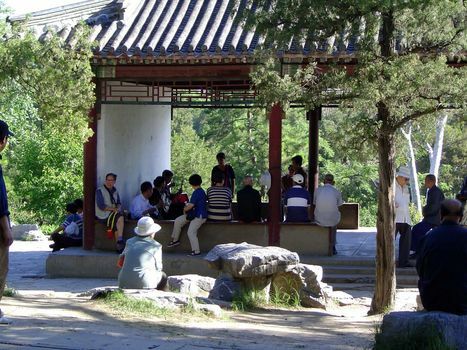 If so, the outer one was for guests; the inner, for the family, much like the division between the Outer and Inner parts of the Forbidden City. 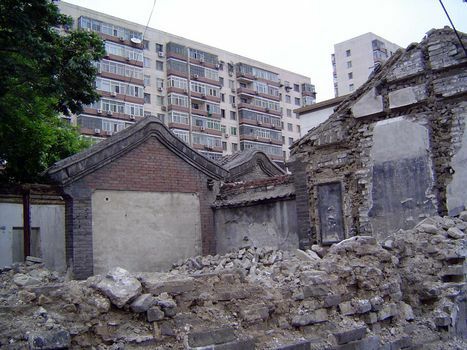 The two houses we've just looked at--now empty and lifeless--have little in common with most of the surviving courtyard homes. 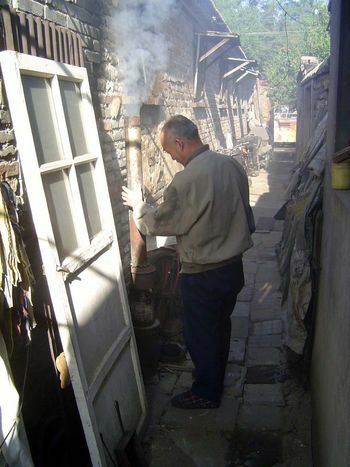 Some 800 were said to survive intact in 1989, but 80 percent of them were the homes of senior officials, military or civil. 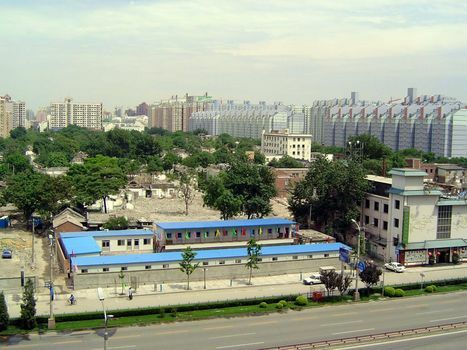 They still cluster chiefly in one district, Feng Sheng, west of the Forbidden City but just east of the Second Ring Road. They're hard to see--and atypical. 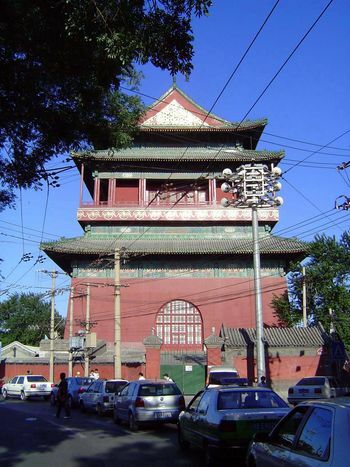 For the typical siheyuan today, we return to the Bell Tower, north of the Forbidden City. 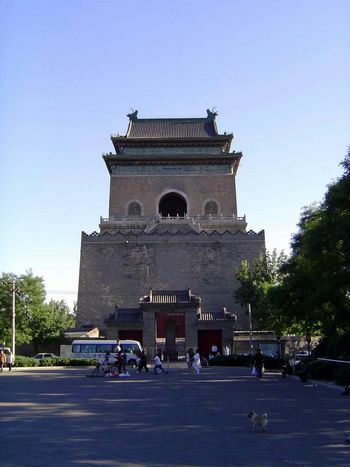 Just south of it is the Drum Tower, seen here from the east one morning. We'll climb to the balcony. 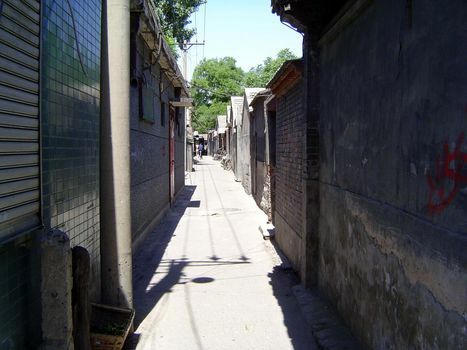 An axial street runs south to Jingshan, lost in the haze. But the view in other directions is over barbarized courtyard houses. Notice the tree that's boxed in. You can make out the main hall on the north (to the right of the tree), as well as the flanking halls. The south hall no longer faces the courtyard, whose south side is built up. 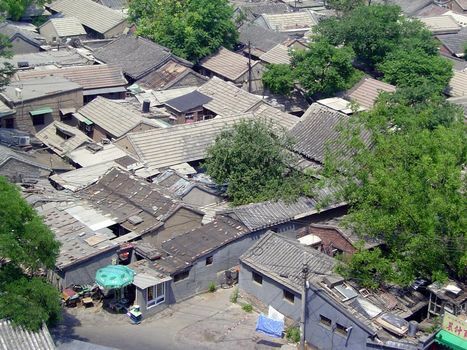 The district is Nan Luogu Xiang, designated by the city government in 1990 as a "traditional one-story courtyard housing preservation district." Well, it sounds good on paper. 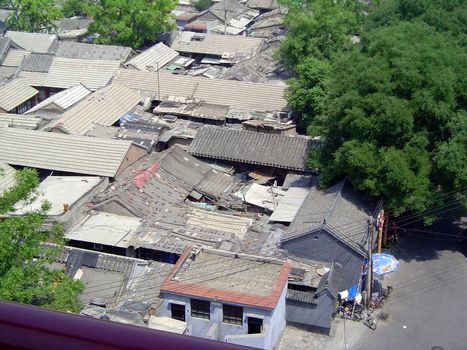 Here's another case, with the courtyard in the lower center entirely covered with roofs. A third case, with two prominent and matching ridge lines that no longer flank a courtyard. 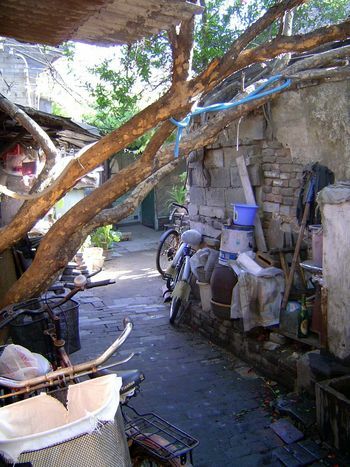 From the street, the clutter obscures the underlying courtyard pattern. Crowded, it's also shipshape, of necessity. Want to save all this? One observer, quoted in the Christian Science Monitor in 2001, said: "I think it's a little romantic to speak of saving them. You only need to watch an elderly grandmother walking across thick ice at 5 a.m. to go to the public toilet to be dispelled of this idea." 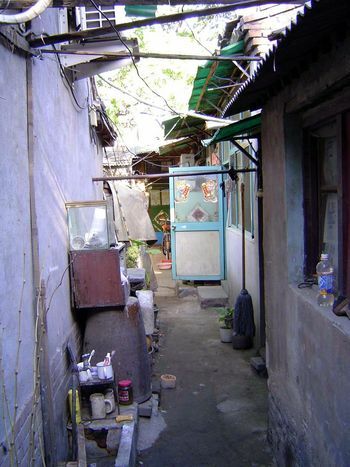 A resident who rented two rooms with her husband, son, and in-laws told the same reporter: "We've lived here since 1982, and we don't want to wait any longer for a toilet. The building is falling apart." There's plenty of life, though. No end of lanes to wander, many dead-ending. Down this one, stove repairs. 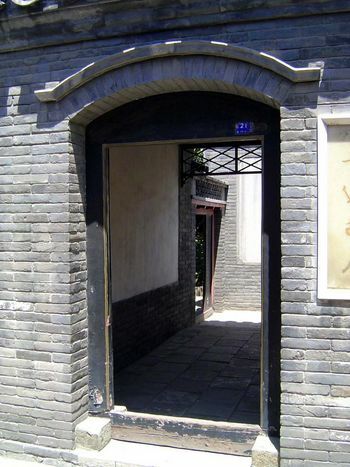 Inside this simple gate: many households. The entrance stones hint at the status of the family within, once. 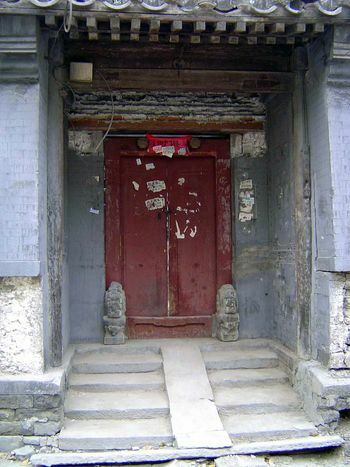 A more elaborate entrance, indicative of considerable wealth--once. Out with the old! 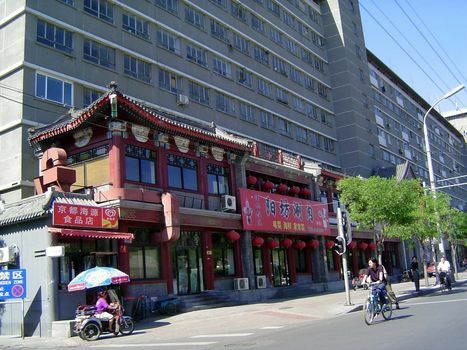 Highrises are not supposed to be built within the Old City, but the rule is flouted. 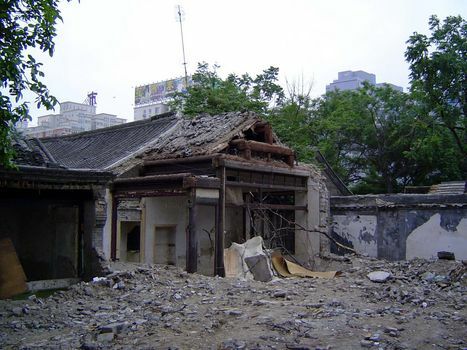 Here, active demolition in 2004. Get a sense of the housing density on its way? 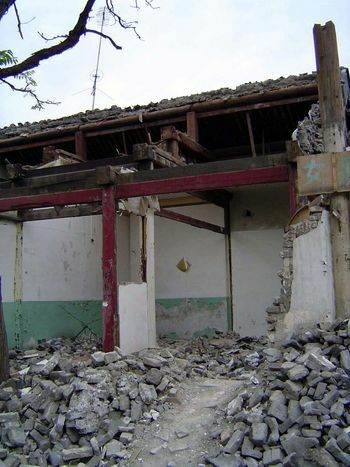 As the houses are torn down, their structural solidity is revealed. Framing was massive, to support the heavy tile roof. The contrast can be shocking. Ground zero, and the new dispensation. The results? 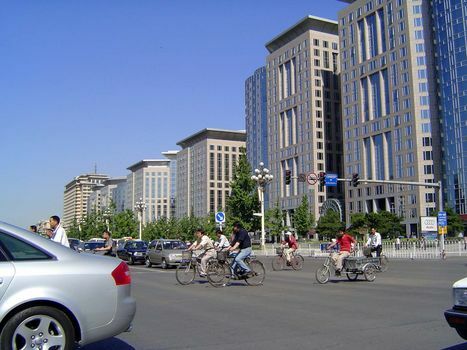 This is the main road running east-west past Tian'anmen. If it wasn't for the bicycles, you might think you were in Washington, D.C.
On the other hand, efforts to look Chinese tend to look absurd. 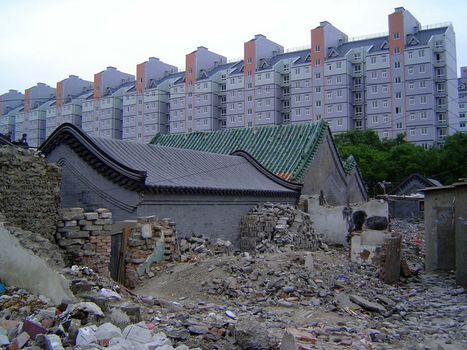 People often say that modernization won't obliterate cultural diversity. Juxtapositions like this show the hollowness of that argument. 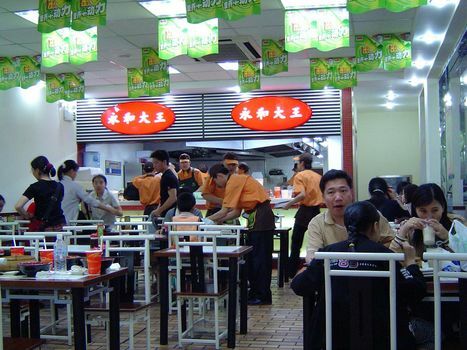 No pretensions at any Chinese traditions here in SOHO, a proud development on the east side of the Third Ring Road. 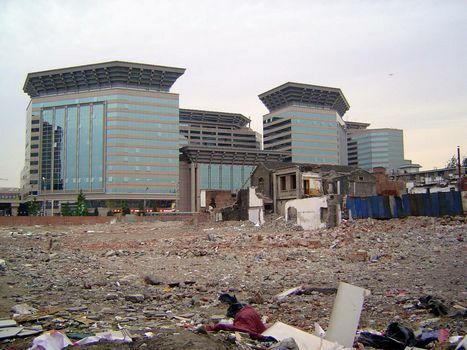 Its developers are the subject of a chapter in Jianying Zha's Tide Players, 2011. If you lived here, you'd be home now. Just pray that you remember your apartment number. The controversial hamburger--oops! 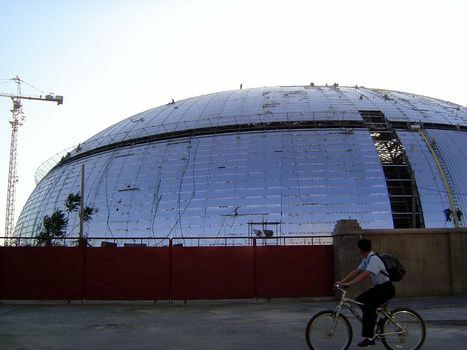 National Grand Theater--designed by Paul Andreu. It's the biggest project built near Tian'anmen since Mao's mausoleum and was said to be Jiang Zemin's monument--good reason for Chinese not to protest overloud. Here it's under construction, promising a 2,500-seat opera house, a 2,000-seat concert hall, a 1,200-seat theater, and smaller halls. 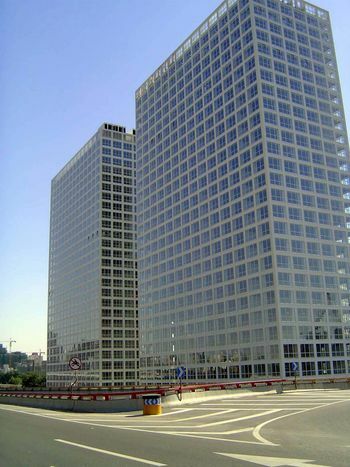 Can East and West blend architecturally? 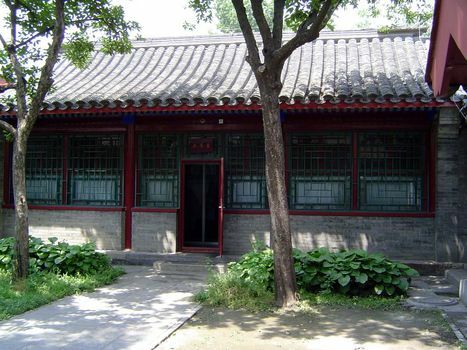 Perhaps this home comes as close as any: it's a museum now, in honor of its last resident, Soong Ching Ling, Sun Yatsen's widow. No time for a reflective moment. As an executive says, there are only two speeds in China: fast and faster. Faster and faster food, too. 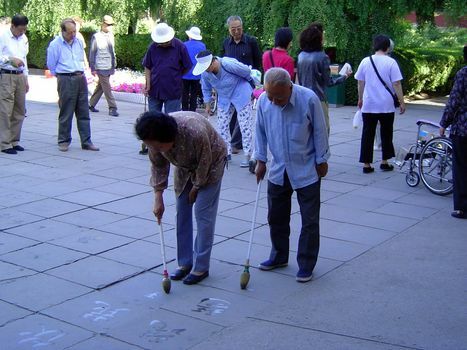 Some holdouts: calligraphy practice in the park at the foot of Jingshan. Up top: mostly old folks, enjoying the morning. 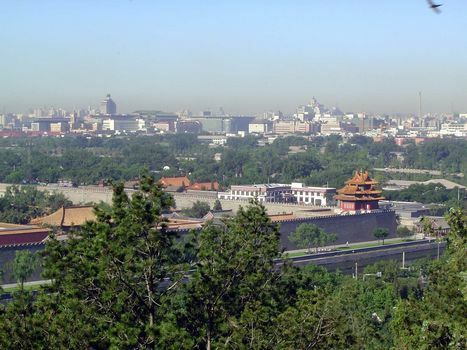 They look over the northwest corner of the Forbidden City and westerly to the New City. 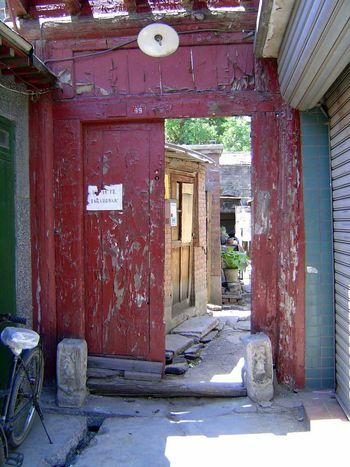 Recommended reading: Wu Liangyong, Rehabilitating the Old City of Beijing: A Project in the Ju'er Hutong Neighborhood (1999). 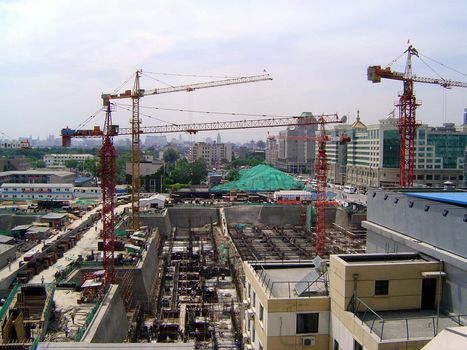 Wu writes (p. 34): "multi-storey buildings have sprung up here and there. I remain to be convinced that this is the destiny of history; rather, it may be simply lack of imagination on the part of planners and designers."